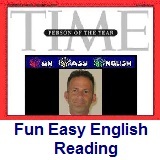 ﻿ Fun Easy English - reading practice and learning about the holiday Winter Solstice. The winter solstice occurs in winter. It is the time at which the sun appears at noon at its lowest altitude above the horizon. In the Northern Hemisphere this is the Southern solstice, the time at which the Sun is at its southernmost point in the sky, which usually occurs on December 21 to 22 each year. In the Southern Hemisphere this is the Northern solstice, the time at which the Sun is at its northernmost point in the sky, which usually occurs on June 20 to 21 each year. The axial tilt of Earth and gyroscopic effects of the planet's daily rotation keep the axis of rotation pointed at the same point in the sky. As the Earth follows its orbit around the Sun, the same hemisphere that faced away from the Sun, experiencing winter, will, in half a year, face towards the Sun and experience summer. Since the two hemispheres face opposite directions along the planetary pole, as one polar hemisphere experiences winter, the other experiences summer. More evident from high latitudes, a hemisphere's winter solstice occurs on the shortest day and longest night of the year, when the sun's daily maximum elevation in the sky is the lowest. Since the winter solstice lasts only a moment in time, other terms are often used for the day on which it occurs, such as "midwinter", "the longest night" or "the shortest day". But it should not be confused with "the first day of winter" or "the start of winter" (Lidong in the East Asian calendars). The seasonal significance of the winter solstice is in the reversal of the gradual lengthening of nights and shortening of days. The earliest sunset and latest sunrise dates differ from winter solstice, however, and these depend on latitude, due to the variation in the solar day throughout the year caused by the Earth's elliptical orbit (see earliest and latest sunrise and sunset). Worldwide, interpretation of the event has varied from culture to culture, but many cultures have held a recognition of rebirth, involving holidays, festivals, gatherings, rituals or other celebrations around that time. The information above states that the winter solstice should not be confused with "the first day of winter" although, at least in the United States of America these two dates are considered to be the same. 1. The winter solstice is the time at which the sun appears at noon at which of the following? 2. When is the winter solstice in the Northern Hemisphere? 3. When is the winter solstice in the Southern Hemisphere? 4. A hemisphere's winter solstice occurs on which of the following? 5. During the winter solstice many cultures hold all EXCEPT which of the following?